This was definitely one of those Must Make Again recipes. I’ve been making Hungarian Mushroom Soup (from the Moosewood cookbook) for years, but for some reason this week I decided to try a recipe for “goulash soup” from Barbara Kafka’s soup cookbook, which turned out to be vaguely similar – it has paprika and onions as the flavor base – but is very much its own thing. I didn’t follow the recipe slavishly, but I more or less kept to the ingredient list, and it was incredible. It didn’t hurt that the stew beef I used was from our latest quarter-cow from Skagit Angus, tender and really beefy-flavored. The original recipe called for coating the beef in flour before frying it, which I didn’t feel like doing. I thought about making a roux separately to thicken the soup, but it turned out not to be necessary – the texture of the broth was thick and silky. kosher salt, maybe a tsp? I salted the beef, then seared it in a soup pot in two batches with canola oil at high heat, then set it aside. In the same pan, I added the butter, turned the heat to medium and sauteed the onion. Once it softened I added the paprika, then put the meat back in, mixed it all up, and added the stock. I brought it to a simmer, covered the pot, turned the heat to low and let it cook for an hour. At this point I added the potato, garlic and bell pepper, recovered the pan and cooked for another fifteen minutes or so. Then I uncovered, added the caraway seeds and tomato plus some water to rinse out the can, brought the soup back to a simmer, and added the pasta. Once the noodles were done, I checked for seasoning, added a little salt, and served with sour cream. Last weekend I was craving oysters, so we picked up a couple of bags at Taylor Shellfish and invited some friends over. The quandary with oyster nights is what to serve for a main course – you don’t want something too heavy, but it needs to be interesting enough so you don’t just skip it and fill up on nothing but oysters. Not that there’s anything wrong with that. 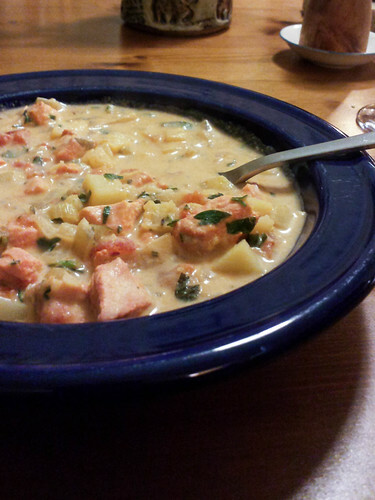 In any case, this time I tried a recipe for salmon chowder from Becky Selengut’s book Good Fish. 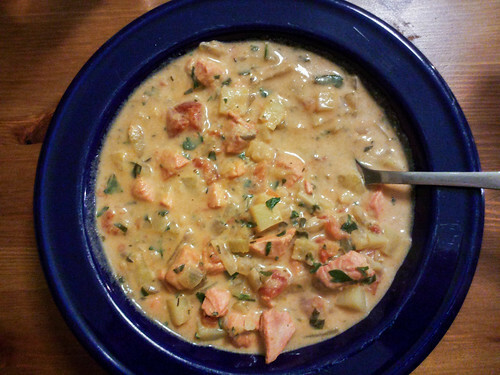 The base is classic chowder, with celery, onion, potato and cream, but it also adds tomato for color and extra flavor, and the salmon (in this case, a piece of wild sockeye) is cut into small pieces and added just before turning off the stove so it cooks in the residual heat. It turned out great. I often like the idea of chowder more than the reality, but this was what chowder should be: creamy and flavorful but not gluey, and the salmon was perfectly cooked and not at all fishy. We ate it with some addictive buttermilk rosemary crackers from Offshore Baking in Maine (owned by Neal and Kathy Foley, our hosts from Duckfest, who recently did an Indiegogo campaign to help pay Kathy’s medical bills – the crackers were our perk, and I highly recommend them). 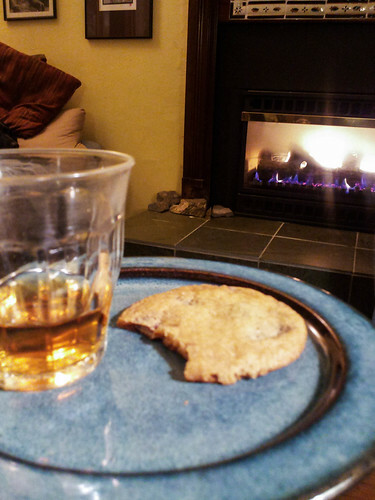 For dessert there were chocolate chip/malted milk ball cookies from the freezer and glasses of good bourbon, making for a perfect winter evening by the fire. 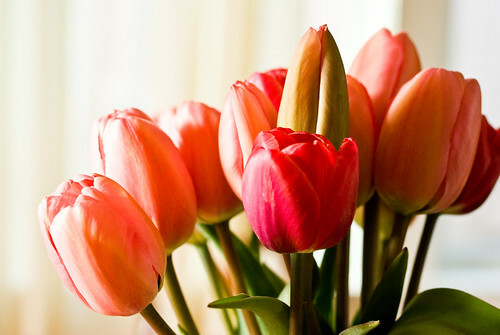 Spring has sprung at last (although it’s raining again today, at least it’s a relatively warm rain). 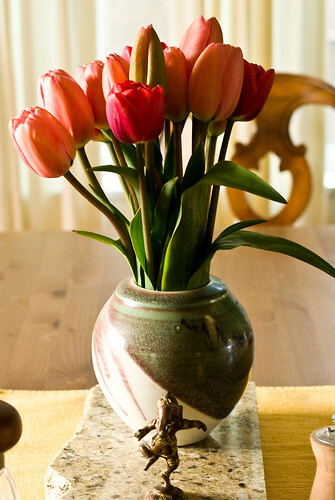 The tulip fields are coming into bloom (clogging up the local roads with tourist traffic), and my own garden is dancing with narcissus and muscari. We had a small brunch party this past weekend to celebrate spring/belated Easter, and it was good. 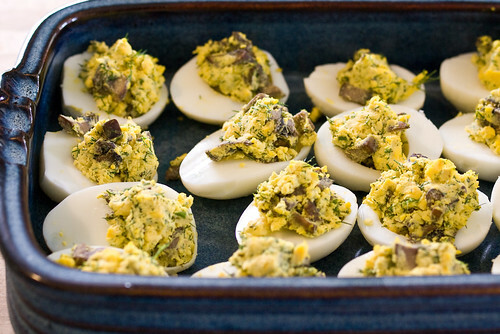 Of course, there were curried eggs (shown here without their blanket of curried bechamel). I don’t mess around with this recipe very much, because it’s so darned tasty – I especially love the fresh dill in the stuffing. I did use Mexican crema in place of the usual sour cream, since we had a big jar of it. And the prosciutto-wrapped asparagus, which we tossed into the oven at 400° and then forgot about yet somehow did not destroy. We still don’t have local asparagus, but this was lovely stuff from California by way of our local co-op. 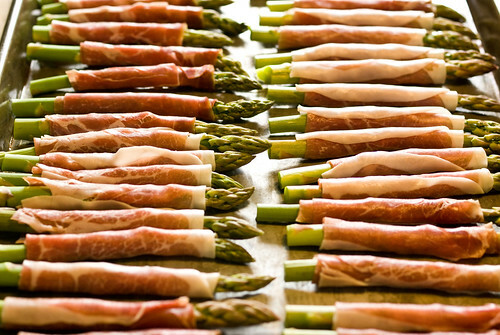 The prosciutto adds enough fat and salt that we don’t need to add any additional seasonings. One of our guests brought a big bowl of gazpacho, which was a fabulous idea and really delicious with the eggs and asparagus. 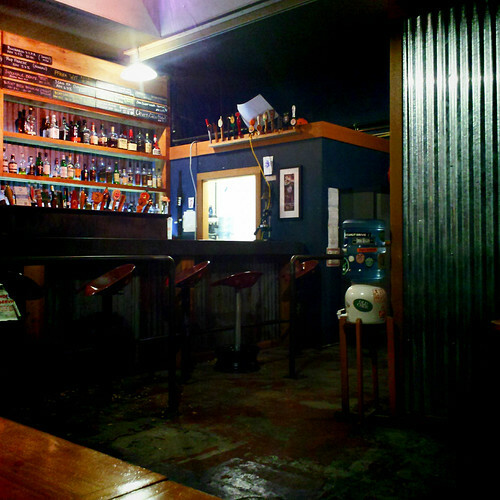 We might have to make this a regular feature of these brunch parties. 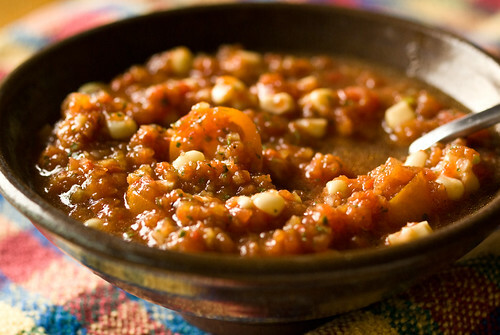 He added kernels of fresh corn, which I’ve never had before in gazpacho and really liked. We ate leftovers of this for dinner with a few poached shrimp. 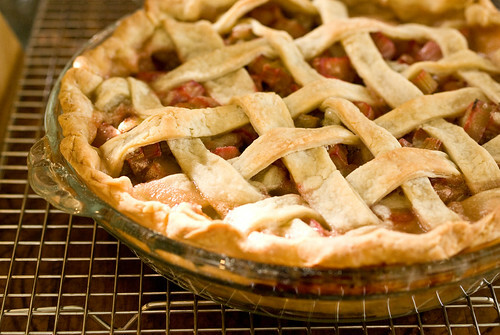 Then there was pie. I did a straight rhubarb pie with a butter crust and lattice top, then we tried a new recipe from Dorie Greenspan’s Baking: From My Home to Yours for Lemon Cream Tart. 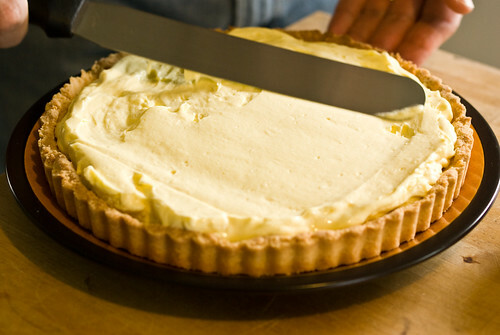 The word “cream” here is misleading, as the tart doesn’t contain any. It does, however, have almost a full pound of butter in it. It was like a shortbread cookie filled with lemon curd, but very (deceptively) light and fluffy lemon curd. I was glad we had guests to help eat it, otherwise I might have done myself a mischief. Spring is off to a good start. 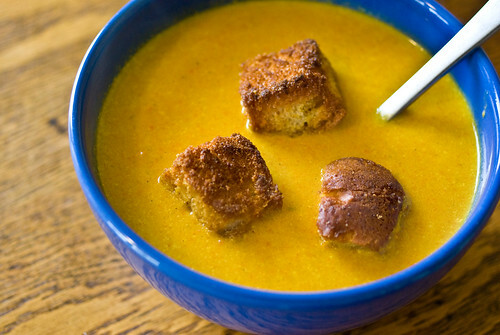 I might have thought that I could eat carrot-coconut soup with garam masala croutons for a week straight without getting tired of it. As it turns out, I was wrong. But I definitely managed it three days in a row. A few prawns in there didn’t hurt, and neither did a spoonful of sambal oelek on the third day, to liven it up. This was a leftover from a cooking class, it was awesome, and now I’ve had enough. Those croutons were really addictive, though. Despite the fact that my husband adores gumbo and orders it frequently in restaurants, I had never made it myself until yesterday. 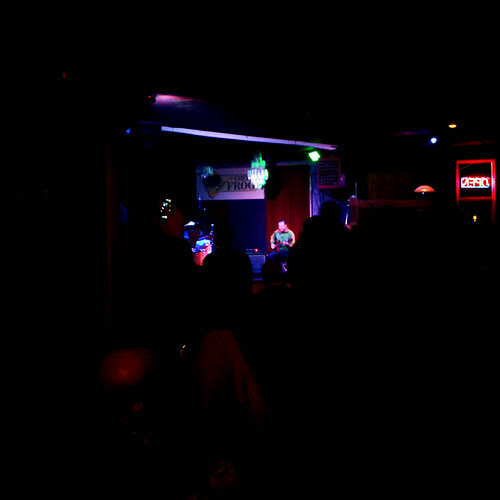 I can’t imagine what I was waiting for. I followed three different recipes simultaneously, all from James Villas’ Glory of Southern Cooking , a used copy of which we recently acquired. He includes one seafood gumbo thickened with roux and okra, one with boiled chicken, sausage, roux and file powder, and another with seared chicken and some remarkably overcooked seafood but no roux at all. I wanted to include chicken, andouille sausage and prawns, and I had okra but no file powder, so I sort of combined them all. 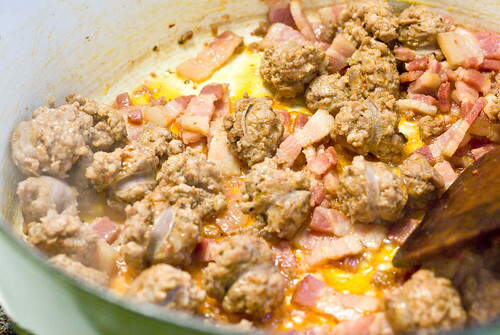 First of all, I fried chopped bacon and sliced raw andouille sausage together, then scooped them out into a bowl, leaving the spicy fat behind. Then I fried pieces of boneless chicken thigh meat in the pork fat, taking it out when just cooked through. When the chicken was cooled enough, I shredded it and put it aside with the bacon and sausage. Then I added a quarter cup of white flour to the fat to make a roux, and cooked that for a while on low heat. 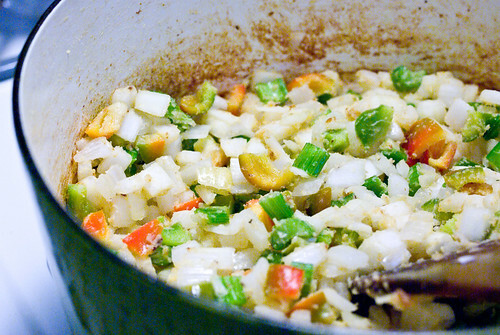 Chopped onion, celery and bell pepper were mixed into the roux, then a bag of frozen okra. After all that had cooked for a bit, I put in chopped parsley (and a few celery leaves, since I had them), dried thyme, a bay leaf, a quart of chicken stock, and two cans of tomatoes. I let that simmer for about an hour, then put the meaty bits back into the pot. After another 30-45 minutes, we put on rice to cook, then added a pound of raw peeled shrimp to the gumbo and let it simmer quietly until the rice was done. I served the gumbo ladled over heaps of hot rice. 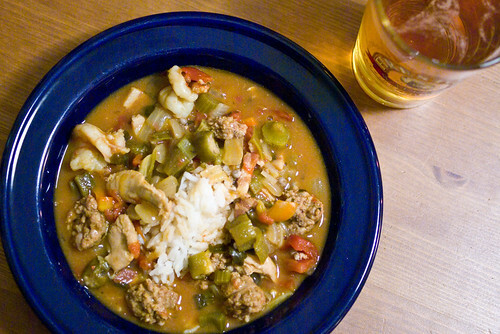 It tasted exactly like gumbo, and a really, really good one, too. This may have just taken up permanent residence in our cooking repertoire. 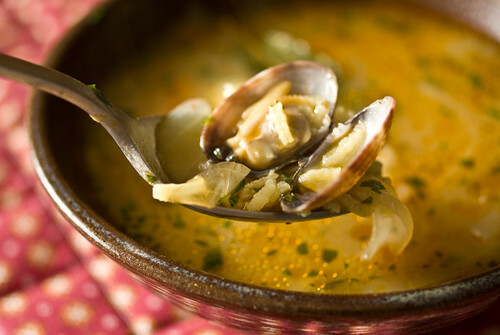 A week or two ago I was looking for something simple to do with fresh local clams, and found this beautiful, very easy Galician soup. 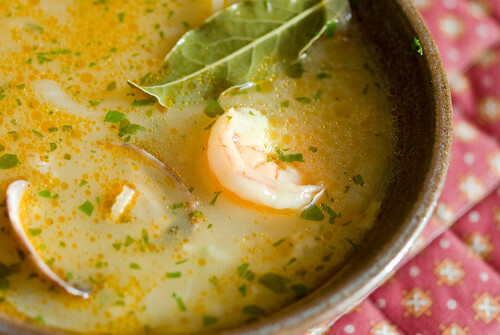 The secret seems to be the broth of sauteed and simmered shrimp shells, which gives a wonderful depth and flavor to the soup. There are all sorts of variations that could be made with this (greens? potatoes! fish of all sorts! ), but it really was nice with the clams and shrimp, seasoned with sweet onions, fennel, bay and paprika. It’s a great excuse to eat fresh bread. With, say, green olive butter smeared all over it. For example. Shell the shrimp and put the meat back in the fridge, reserving the shells. Heat 4 Tbsp of olive oil in a saucepan and add the shrimp shells, frying until they turn pink and begin to smell good. Add the tomato, thyme, fennel seed and water and simmer 20 minutes. Set aside (I might mash the tomato up a little at this point, for extra flavor). In a soup pot, heat another 4 Tbsp of olive oil and add the onion. Cook on medium with a pinch of salt until the onions are soft and golden, about 15 minutes. Add the garlic and bay and cook a minute more, then add the paprikas, saffron infusion, rice, and half of the parsley, then strain the reserved prawn stock into the pot. 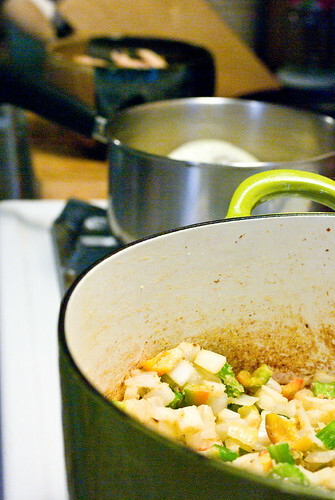 Bring to a boil and simmer 10-15 minutes, until the rice is cooked. Add the clams and cook just until they all open (discard any that refuse to open), then stir in the shrimp and the rest of the parsley. Simmer just long enough for the shrimp to cook through, and serve. Last weekend at the farmer’s market I was seduced by a pile of gorgeous cauliflower at one of the booths. 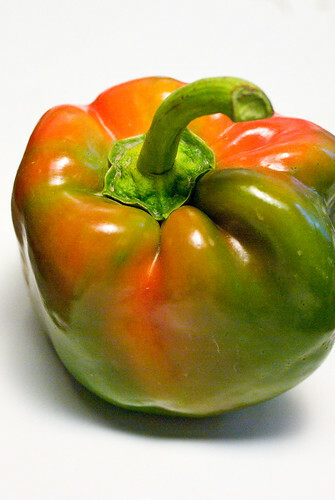 I wasn’t at all sure what I wanted to do with it, so when I got it home I opened the first book I think of when looking for interesting and unusual uses for fresh produce: Moro East . I lit on a recipe for cauliflower soup with cumin and coconut milk, and was instantly sold. I seldom make pureed soups, but really like them when I do. I simplified the recipe a bit as I went, and liked it so much I wouldn’t make it any differently next time, although it might be even better if you followed the cookbook exactly – especially the caramelised chile butter with pine nuts drizzled on at the end. As it was, I loved the smooth texture, the quiet spices, and the hint of coconut peeking out from the cauliflower. I ate a bowl of it, sprinkled with smoked paprika, while waiting for the rest of dinner to cook, then ended up pouring spoonfuls of it over a pita stuffed with beef kebabs and spiced eggplant, as if it were tzatziki sauce. Fabulous. Saute the onion slowly in olive oil or butter (or a mix) in a soup pot until soft and golden, 20-30 minutes. Add cumin seed, cinnamon and garlic and cook a minute more, then add the cauliflower and stir it up well. 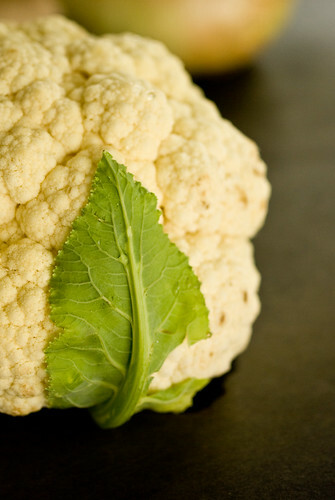 Add a splash of water, cover and steam for 15-20 minutes, until the cauliflower has softened. Take the cover off and mash the cauliflower with a spoon or potato masher, continuing to cook if it’s not quite soft (add more water if it dries out). Pour in the broth and coconut milk, bring to a simmer and cook ten minutes or so. Salt to taste. 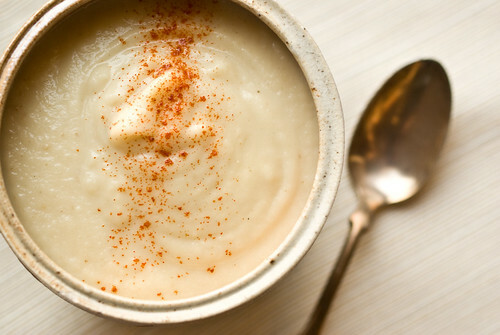 Turn off the heat, then use an immersion blender to puree the soup smooth (I would recommend not trying this in a countertop blender, unless you want scalding cauliflower soup all over your kitchen). Check for seasoning, then serve. Directions: in August (approximately six months before serving), barbecue some pork ribs. Make sure they’re good and charred and salty. Eat them, then make stock out of the bones and freeze it. In April, take the stock out and thaw it. Cook some beans. Blanch collard greens and chop them. Sear chunks of country-style boneless pork ribs in oil and remove them from the pan. Saute a lot of garlic in the remaining oil, then add back the pork and pour in the smoky, salty stock. Simmer, covered, until the meat is tender, maybe an hour. 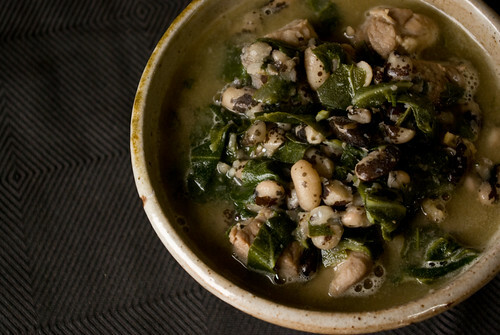 Add the beans and greens. 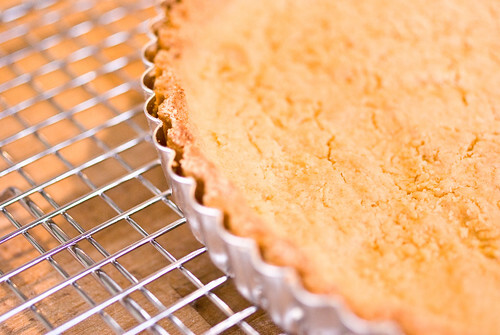 Eat voraciously, and wish you had thought to make cornbread.